2 How To Check UP Scholarship Status 2017-18? UP Scholarship Portal offers a online facility to check the Post Graduate Scholarship and Reimbursement status of the online application form of the student studying outside the state for Session 2017-18. 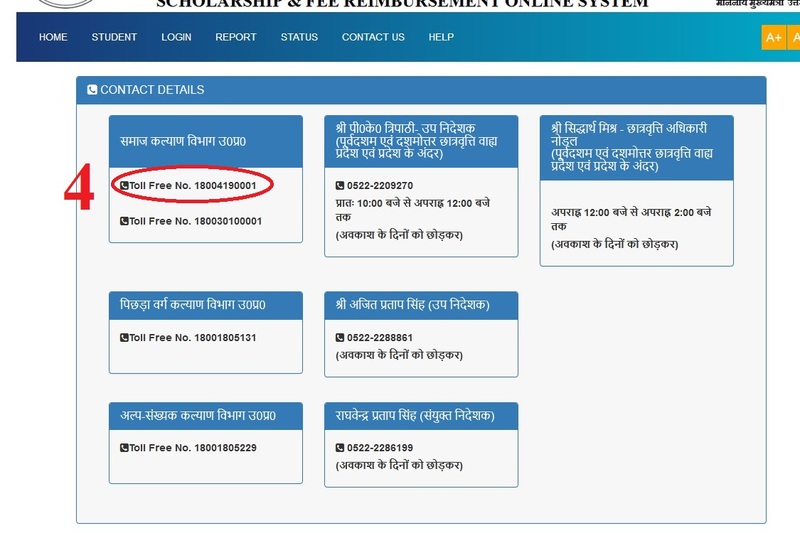 How To Check UP Scholarship Status 2017-18? Just follow the simple steps to track your application status of UP Scholarship & Fee Reimbursement. Step-4 : Finally click on the ‘Search’ link to track your application status. Contact Details are available in the UP Scholarship Portal. You may contact the corresponding department for your scholarship queries. To view the department wise contact details, follow the steps mentioned below. Step-2 : Then go to the ‘Contact Us’ menu. Step-3 : You can find the departments contact numbers in that page. Step-4 : Ping the numbers for your scholarship queries. My registration number is 460030201800528 and Date of birth is 26/02/2001. Please tell my application status. My registration number is 501541201800014 and my Date of Birth is 30/06/2002. Please tell my application status. My registration number is 501541201800014. I am a 1st year student from Uttar Pradesh and My Date of Birth is 30/06/2002. Please give my scholarship. My account number is not verified by bank through PFMS. I want to enquire about the status of my scholarship and I really need it. My parents can’t afford to pay my school fees. Please help me to find my registration number. I have forgotten my registration number but I want to print the final form. What can I do? Please help me to find my registration number and password. I am a B.Sc Agriculture student from Uttar Pradesh and belonging to SC category. My scholarship amount is Rs.45000 but I received only Rs.10000. My registration number is 145600201701651. Please help me. I have done M.Sc with 70% mark and got scholarship in 2018 but, now this session 2018-2019, I am doing BTC (UP) and can not apply as fresh candidate but last year I applied and got scholarship. When I applied as fresh candidate last year registration number is displaying. Please tell me some suggestion so, I can apply for scholarship. I want to renew the application for year 2018-19 but I have forgotten my registration number of 2017-18. What can I do now? Please suggest me. I want to know my last year register number. How and Where can I find out? I am a VBSPU Jaunpur student. I have lost my registration number, Please help me. I am a B.Tech 2nd year student. I have forgotten my registration number. May I search it on any site? I am a MA student. I have applied and submitted all documents. My registration number is 340820201700838. When will I get my scholarship? I am a B.A student. My registration number is 630530101700175 and Date of Birth is 10/07/1999. Please send the scholarship. I am a B.Sc 1st year student. I am belonging to a poor family. Please help me. I have applied for M.Ed scholarship. My registration number is 070170201600205. Current Status is Under process. I need the scholarship registration number for class 10th. I am a student of class 12th. I need this scholarship, can I apply? I am a Polytechnic 1st year student. My registration number is 631170401700231. Please give me the scholarship amount. I want to enquire about the status of my scholarship. Before submission everything was corrected twice and I myself has checked my details carefully. I am sure about my details. Please once check it. This scholarship is really very much important for me, I really need it not only for myself but to provide some relaxation to my parents as by this scholarship I can pay some of my hostel fees. I have lost my 2017-18 registration number, how can I find it? I am a student of B.Ed. I have no money to complete my studies. So I need a scholarship. I am studying 11th standard. My registration number is 560182192700560. Please give me the scholarship. I am studying in Jwala Devi Saraswati Vidya Mandir, Allahabad. My registration number is 451392101700061. My registration number is 671030501700869, Please send my scholarship. Please send the scholarship amount to my account for my registration number 350420111700770. I am a D.EL.ED student. My register number for session 2017-18 is 340810501702161. 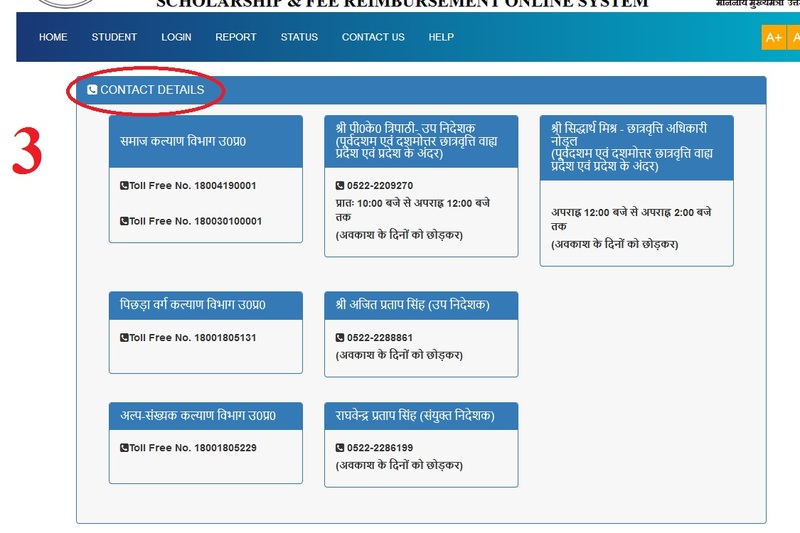 Last month, the status showed that, ‘It is passed by district committee and scholarship not given due to non availability of fund’ but now, it is showing ‘not valid registration number’. I am inter class student. My registration number is 520222111700017. Please give my scholarship. I AM A STUDENT OF MBA (FC) IN IMS UNIVERSITY OF LUCKNOW. MY REGISTRATION IS 270400201700041. STATUS IS SHOWING, PENDING AT DISTRICT LEVEL. I HAVE SUBMITTED ALL DOCUMENTS CORRECTLY. PLEASE RESOLVE MY PROBLEM AS SOON AS POSSIBLE. I am a last year student of B.Sc Agriculture. My registration number is 310050121706355. Please give my scholarship. I am a B.A. Social student. My registration number is 670440301700441 and Date of birth is 07/08/1999. Please send the scholarship. I am a B.Com student. My registration number is 340360121723954. Please send my scholarship. I am doing BA 3rd year. My registration number is 160110101601830. Please check and tell my scholarship status. My registration number is 210551401700025. Please give my scholarship. I am a student of B.Ed 2nd year. My registration number is 450650511701262. I want to know the reason that, why my scholarships had not come. I have also not got the scholarship in B.Ed 1st year. My registration number is 061010501700085. Please send the scholarship. I have forgotten my registration number of 2017-18. How can I get it again? Please send my scholarship amount soon. My registration number is 161670501725911. The link which is given above is not working. Please check it. I am a BA student. My registration number is 460120111700918. Please send my scholarship to my account. I am a ITI last semester student. My registration number is 317430135712. Please send my scholarship to my account. My registration number for session 2017-18 is 450501501109. I am reading M.Sc first year. My date of birth is 10/10/1995. I want to check the scholarship status. I am doing B.Sc 3rd year. My student registration number is 220100221706947. Please give my scholarship. My Registration number is 612830211700895. Please send my scholarship. I am a B.Tech 1st year student. My registration number is 020450201700106. Please send the scholarship amount to my account. My register number is 142610211700076. When will you announce the merit names? I am in 2nd year B.Sc. Please check and tell my scholarship status. I am a BBA 1 st year student. I applied for a scholarship but there is no response from your side. My registration number is 320970101700089. I have not get my money yet. Please show me the latest status of my application. 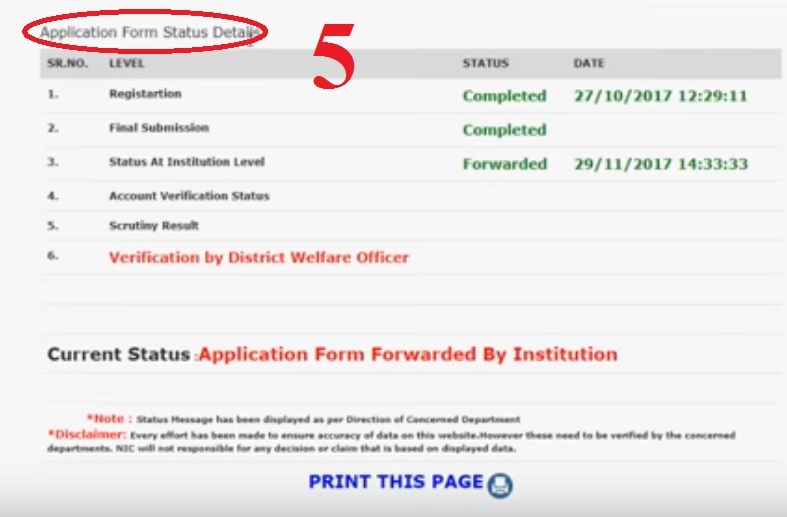 I am going to complete my 3rd year but I have not received anything even I have submitted my documents correctly. I am a M.Sc first year student. I want to know about my scholarship status. My registration number is 470450501700953. I am a B.Lib.I.Sc. student. My registration number is 26005010002457. I want to know the reason, why my scholarship did not come. I am a student of MBA 1st year from Sheate college Varanasi. I have not got my scholarship yet. My registration number is 671230501700499. Kindly check and tell my scholarship status. I am a BA 2nd year student. Please give my scholarship. My registration number is 151380201700129. Please check and tell my status. My application number is 5701301117000461. I am a MA 2nd year student. Please show my application status. My registration number is 470500201701370. What is my application status? I want to confirm that, why my scholarship is getting delay, I had completed my all documents correctly. Please tell me. and My registration Number is 220080111700249. I am a ITI last year student. My registration number is 471440101700026. Please show my application status. I am a BA part 3 student. My registration number is 720270121707015. Please show my application status. I am a B.Sc Biology 1st years student. I have not received my scholarship. My register number is 454480501700371. I am doing B.Sc 2nd year. My scholarship has not come to my bank account. Please send my scholarship. My registration number is 400760111700116 and Date of Birth is 25/04/1998. My registration number is 220010101701091. Please show my application status. I am doing D.Pharm 1st year and belonging to General category. I have not received my scholarship yet. When will I get it? Please give me the scholarship amount of Rs.5400. My registration number is 750310101700778. Please give my scholarship. I am studying M.Sc and I belong to OBC category but I have not received scholarship & Fee reimbursement. So please send my scholarships fee reimbursement. My registration number is 360010101702231 for the session 2017-2018. I applied for BA II scholarship. My registration number is 560330501700055. It got verified by District Welfare Officer and Pending at District Scholarship Committee. I want to know the result. I am a student of B.A 3rd year. I want to know my scholarship status. Last year, I submitted my SKV form but by mistake I forgot to fill my result so, my SKV is rejected and also show me that student status is failed while I am pass with 80% marks. So please solve this. My register number is 580740201700250. I am a BA first ear student. I want to know my application status. I am a student of B.Pharm 3rd Year. I want to know my scholarship status. I am a student of ITI. I have no money to complete my studies. So I need a scholarship. I want to know the reason, Why has the scholarship not come yet? MY REGISTRATION NUMBER IS 490570501700625. ALL PROCESS ARE COMPLETED BUT THEN SCHOLARSHIP IS NOT YET COME. I REQUEST YOU, PLEASE SEND IT SOON. I am a BA third year student. My registration number is 460530101700406. Please show my application status. I want to confirm that, why my scholarship had not came, I had completed my all documents correctly. Please tell me. I applied for BTC scholarship. I want to know the result. I am a B.Sc 2nd year student. Can I apply for this scholarship?